Our company representative will meet you at 7:00 am from your hotel or place of residence in Kampala. Drive to Mbarara (283km from Kampala) via Masaka. Make a first stop over at Equator crossing for snacks and photography. Proceed with a visit to Igongo Cultural village this is more rewarding and amazing as you visit the Ankole museum. Lunch break is made at Agip Motel Mbarara. After lunch, drive to Bwindi. This is the lushest highland rain forest on earth, filled with primates and exotic birds, valleys, hilltops, and papyrus swamps. Begin the day with breakfast ready for trekking, which begins at 8:00 am with a briefing from the UWA staff. Ensure to carry along with you rain jacket, drinking water, snacks, jungle boots etc. the guides will lead you inside the jungle to see the shy Primates for a group you have been booked for. Do not forget to take your lunch boxes and all the necessary gear to track the rare Mountain Gorilla, perhaps one of the most exciting wildlife experiences on earth. The tracking may take between 2 and 6 hours but it’s well worth the effort. The afternoon is spent on a village walk. The Buhoma Village Walk gives you a great opportunity to see how the people surrounding Bwindi Impenetrable Forest. It also is a great way to support the local community in a direct way. The Walk begins with your guide at Buhoma Community Rest Camp and is most informative, rewarding to the average visitor. It will amaze you how resourceful the local people are as you see and learn their ways. After early breakfast head for Ishasha, which is the southern sector of Queen Elizabeth National Park, carry out a game drive where you may sight tree-climbing lions. Ishasha is dominated by acacia woodland and scrubland and features the meandering Ishasha River, banked by a riparian forest. After picnic lunch drive all the way to the northern sector of the park. Begin your day with a cup of coffee. Early morning game drive along Kasenyi and Queens Mile makes visitors encounter elephants, buffalo, water bucks, warthogs, lions, Uganda Kobs lakes and a variety of birds. Return to the lodge for breakfast and lunch. After lunch, a two hour boat trip along the famous Kazinga channel is worthwhile an opportunity to see Hippo, Buffalo, Kobs, Elephants, warthogs etc. This trip also enables visitor chance to see spectacular birds. 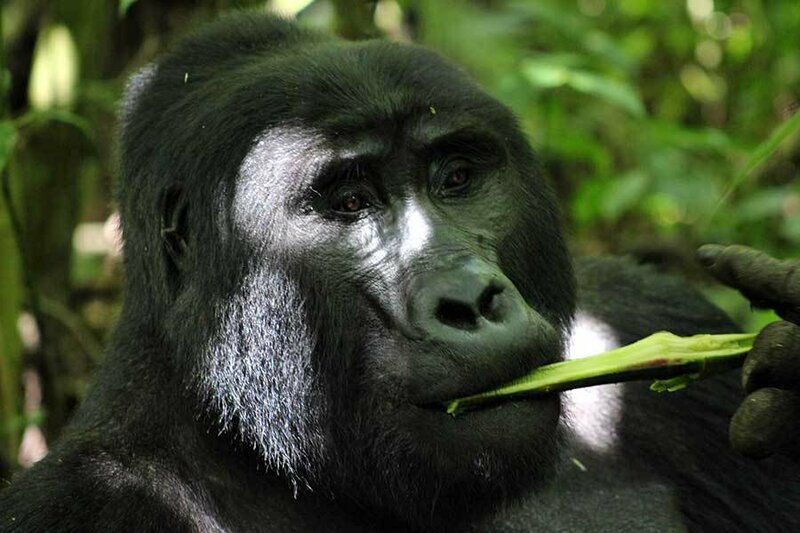 With previous day’s memories, enjoy your breakfast ready for guided primate walk along Kyambura Gorge to look for habituated chimps through the gorge with birding through the gorge as you will be watching a number of beautiful birds. After primate walk, drive back to Kampala using Kasese-Fort Portal road. Enjoy the winding scenery of the foot hills of Mt. Rwenzori arriving in Fort Portal for lunch thereafter continue to Kampala/Entebbe to catch up your evening flight back home.